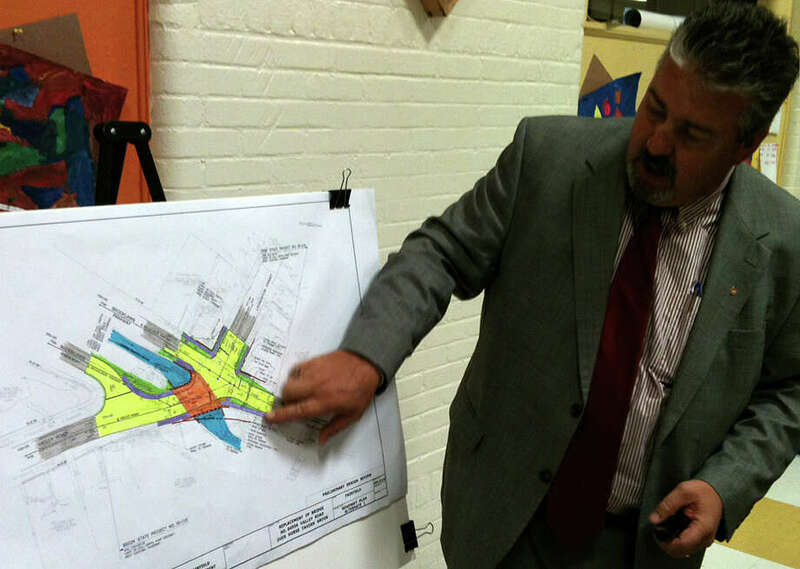 George L. Jacobs, branch manager at the New Haven engineering firm hired to design a new Valley Road bridge, answers a resident's question during a meeting Tuesday night in Stratfield School. A recommended design for replacement of the Valley Road bridge is winning neighborhood support. Two dozen Stratfield neighborhood residents who attended a Tuesday meeting on the bridge project also appeared united in opposition to the possibility of installing shiny steel guardrails for the new span. "It's the approach guardrails," Mike Smith of Valley Road cited as his main concern with the project. "They need to be limited and not the ones you see on I-95 -- not your typical guardrail and not what they put on the Merritt Street bridge." "It's all aesthetics, what does it look like," Smith added. "It's going to be there for 75 years and it should be a positive addition to the neighborhood." Tara Dionne of Valley Road said her main concern is "the aesthetics of the bridge and the guardrails are part of it." "I think we're looking for something more in line with the neighborhood of 1920s' houses and a historic, rustic feel for the bridge in keeping with the neighborhood," she said. William Hurley, a town engineer, was pleased by the turnout at Tuesday night's meeting in Stratfield School's cafeteria. "It's good to know this many people care about the bridge," he said. "The more the public gets involved, I think the better the design and the better the process goes." "I really do believe in my heart the potential for a great-looking bridge exists here," he said. Selectman Cristin McCarthy Vahey, who lives in the Stratfield area, said, "This is an engaged neighborhood that wants to be a part of this conversation." The existing Valley Road bridge consists of two spans, one of which was built in the 1930s and the other in the late 1950s, said Anand Seshadri, the Bridge Department manager at Dewberry Engineers Inc. in New Haven, which was hired to design the replacement bridge. The deck geometry and traffic safety features of the bridge are "substandard," load-carrying segments are in "very poor condition," and the bridge is "functionally obsolete," Seshadri said. Seshadri on Tuesday presented four designs, and said Dewberry's preferred design is a steel multi-beam bridge, with an estimated construction cost of $1.42 million. Estimated construction costs of the other three designs would be $1.3 million, $1 million and $1.44 million. In Dewberry's preferred design, the steel beams under the road would be supported on abutments or footings and the superstructure of the bridge would be hidden between roadways, Seshadri said. He said exposed concrete would have a liner that resembles masonry work and guardrails on the bridge would be an open rail system on both sides. The steel multi-beam design enabled water and gas lines to be inside the bridge, while the other three designs had utility lines on the sides of the bridge, Seshadri said. In the preferred design, the bridge would fit within the road, while in the other three designs it would be wider than the road, Seshadri said. Each of the four designs would have the same roadway, sidewalk, masonry work and open rail system for guardrails on the bridge, Seshadri said. Toward the end of the meeting, Seshadri said residents' concerns with guardrails leading to the span were heard. "We're going to look at either installing a stone wall that can be tapered down or a timber-rail system because that's what the public wants. What the public doesn't want is a metal rail system," he said. George L. Jacobs, branch manager at Dewberry's New Haven office, said, "It does not need to be metal. It could be timber, timber railing supported by large timber posts. We're definitely listening. There are a lot of different options." "When we came here, we didn't fully appreciate the issues you guys have with guardrails," Jacobs said. Construction of the replacement bridge is scheduled to take place from April through November of 2015 and the bridge likely will be closed during construction. Jacobs said closing the bridge, instead of leaving a travel lane open during construction, would save time and money, and be less complicated for motorists. "There are opportunities for detours that are not ridiculous in length," he said. Streets around the bridge may have new signs that designate them as one-way, no entrance or no exit so motorists don't get stuck around the construction zone, Jacobs said. The town has applied for federal reimbursement of 80 percent to finance the cost of design and construction. The town would have to pay the remaining 20 percent. Seshadri encouraged residents to visit www.valleyroadbridge.com for updates and to send e-mails about their thoughts or concerns. "We do monitor this website and we can get back to you," he said. Hurley said another informational meeting would be held before construction begins so residents could see a more complete design. Michael Sears, a senior associate at Dewberry, said the replacement bridge requires at least five permits, and Hurley said the Conservation Commission would hold a public hearing on the project.